This Tex-Mex dish is practically a staple in Texas. It's named for the famous King Ranch in south Texas- the largest ranch in the United States, and one of the largest ranches in the entire world. Although the recipe probably did not originate at the ranch itself, its name will make perfect sense when you take your first bite. This delicious, creamy concoction of cheese, chicken, green chilies, and tortillas earns its big name with its flavors and heartiness. King Ranch Chicken probably originated sometime in the 1940s or 1950s. The use of the cream soups is a part of the original recipe; you can find more recent recipes that use a flour and butter roux to approximate the thick, creamy texture of the original. 1. Preheat oven to 350 degrees. Lightly spray a 13 X 9 casserole dish with cooking spray. 2. In a large bowl, combine the first seven ingredients and mix well. Spread about 1/2 cup of the mixture evenly in the bottom of the casserole dish. 3. Cover the bottom of the dish with a layer of tortillas. Pour half of the soup mixture onto the tortillas, spreading carefully and evenly. Sprinkle with the cheddar cheese. 4. Repeat the tortilla layer and the soup layer. Sprinkle with the Mexican blend cheese. 5. Bake, uncovered, for about 25 minutes or until browned and bubbling. 6. Let casserole sit for 5 to 10 minutes before serving. King Ranch Chicken may have been taken to some of these fun parties! I am so tempted to make a casserole. I have never done one before only because I'm afraid that my kids will say there is too much in there. They like a simple, very simple, dish. But the photo is so clear and crisp, that it just looks so tasty. Perhaps, I'll just go for it and see how it comes out. Sharon, if you do try it, I hope you and your family like it! It's definitely one of our very favorites! :) I'm so glad you came by- thank you! My children LOVE King Ranch Chicken! Sharon, to make it a little smoother and simpler, serve the tortillas on the side instead of putting them in the casserole. I don't know why that should make a difference but it did for my bunch (who prefer not to chew any more than they have to). YUM! That looks absolutely delicious. I am going to try it for sure. Joy, this sounds wonderful!!! I haven't heard of this dish before and you know how much I love vintage recipes. :) Pinning! Thanks for sharing and have a wonderful day! Thank you so much, Cindy, and thanks for pinning! Hearing from you is always a huge bright spot in my day! Well I made your chicken spaghetti and we both loved it so I think I should try this one, too! I remember my mother using "cream" soups. It was all the fashion. I still love to use them! This recipe is just great! Thank you for linking to the In and Out of the Kitchen Link Party. I am so glad you joined me. 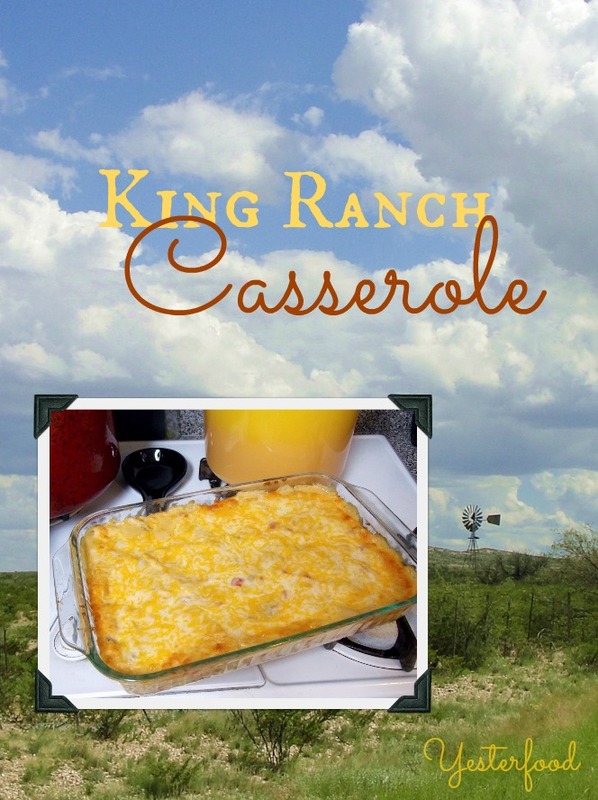 Stopping by from Sweet Tea Social, I just love this King Ranch Casserole, it is so Texas. Hope you are having a great week and thanks for sharing. Thanks, Miz Helen, and thanks for coming by! I appreciate it! This looks so comforting! I have to give it a try! If you try it, I hope you like it as much as we do! :) Thanks for the invitation- I will be there! I have never had this casserole. I've come across recipes for it, but haven't tried it. It looks nice and creamy. Plus I really dig rotel! Thank you for linking this week, Joy! I'm keeping this in mind for a monthly potluck my family attends. Thanks, Michelle! If you try it, I hope you like it- it’s definitely one of our favorites! :) Thanks for hosting a fun party! You already know I LOVE this!! Thanks so much for linking up to our "Best Of The Weekend" party! I have also pinned this to our BOTW party board!! Thank you so much for sharing the story behind this recipe. I have seen similar recipes, with this name, and was always curious as to how it got it's name. Just one of those things I wonder about! Thank you so much, Kris! You are so nice to come by and comment- great to see you! I made a vegetarian version of this once using Doritos! I'll have to try your version too! Jilly, it is a good one! :) Thank you for visiting! I found your blog on Google+ And to reply to your opening "about you" paragraph: Me Too! I'm going to enjoy your blog and I'm a new subscriber. I've not had this King Ranch Casserole for years. Pinned. Lea Ann, I can tell we are kindred spirits! The recipes on your blog....that Macaroni Salad, the Lemon Zucchini Bread...I am home! :) Thank you so much for coming by! Hi Joy, Thank you for sharing this with Foodie Friends Friday this week. I'm sharing this on my FB page this afternoon. This looks fantastic! Thanks so much for sharing this with Foodie Friends Friday. Hope to see you back again next week! This is one of our favorites! Visiting from Melt In Your Mouth Monday. Love King Ranch casserole. Thanks for sharing on Tried and True recipes! I haven't even made this casserole yet, but I pinned it to my Pinterest board. Would you believe, it's already been repinned 205 times? I hope that means you're getting lots of traffic on this post! Oh, thanks, Laura, and thanks for pinning! What fun news. :) It really is a delicious casserole- if you try it, I hope you enjoy it! Hi! I'm from Texas and I probably make this twice a month in the winter time, I love it! I also make guacamole and put sour cream on the side, these are great toppings! Thanks for sharing, everyone should make this for their families,yummy! Liking this one. This is a "fall dinner" casserole for sure! Thanks for linking to Saturday Dishes. Hope to see you tomorrow as we feature pumpkin. I love Tex-Mex or Mexican dishes. This looks really good!! I pinned it! Thanks so much for stopping by Saturday Dishes and linking up. Oh yum! I'm pinning this and love that it is gluten free! This looks so delicious! I'm never made this casserole before and will have to try it because we really like the spicy Mexican flavors! Stopping by Saturday Dishes linky party and pinning to Pinterest!